Day One: What was the Plan? Keep expectations low. That was the plan. Measured. Cautiously optimistic at best. Just a couple of boxes of the new Heir of Scars I paperback as centerpiece, flyers and business cards, plus maybe a couple of things that Vanessa decided to make, like a tic-tac-toe game of white and grey wolves. And a few bronze necklaces with spirit animal pictures. Oh, plus a few dozen art prints of cover art, and forty-one different styles of bookmarks with novel quotations on the back. Okay, Vanessa kind of went all out. I'm probably forgetting something. Anyway, we took an Uber in since we had too much to carry on the Metro without dramatically increasing the risk of getting caught by the doors. Our Grateful Dead-head driver was less excited by the convention than by the fact that I am a writer and Vanessa is Portuguese, and he spent quite some time trying to remember the name of the movie where the writer falls in love with his Portuguese housekeeper and....... finally he realized it was a sub-plot from Love, Actually, and for the next two minutes showed us an extended preview on his phone. BTW, he's absolutely moving to Canada if Trump wins. A brisk and heavily encumbered walk and we make it to the entrance, then are led to walk back along the same path we just took, only just inside the building instead of along the sidewalk, arriving at almost the exact point of dis-Uberment. The floor of the Con was just like the parents' basement of our geekhood dreams, only several blocks long and several storied high. Even only halfway mantled (dis-dismantled? ), it was already impressive. 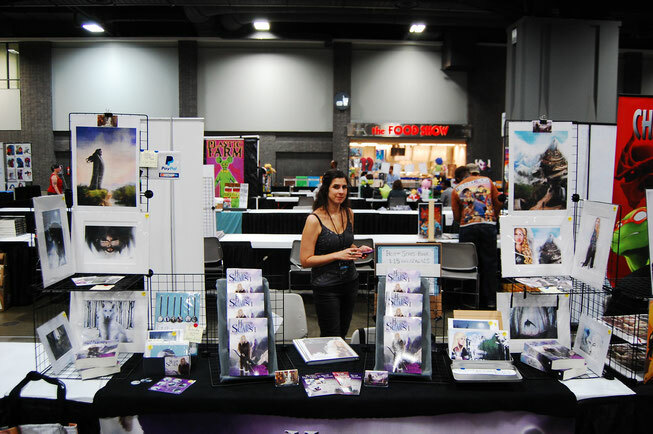 Most of the larger exhibitors had set up on the prior day, leaving Artist Alley the primary barren wasteland we'd soon call home. Booth N12 was, of course, 3/4 of the way back across the hall, making me very glad I packed a replacement shirt and deodorant. Vanessa and I went to work quickly, and we took much of the hour to set up our 8x2 table (sorry Vanessa, that's feet not meters). 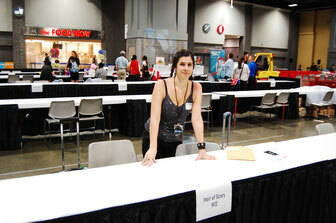 I was very glad Vanessa had designed a layout and that we practiced setup beforehand. I'd have probably spent two of the three days just trying out permutations. On our right Jackson (@arkrevner) had a very nice mix of anime inspired and vibrant original pieces. It was good our expectations were not stratospheric on Friday. 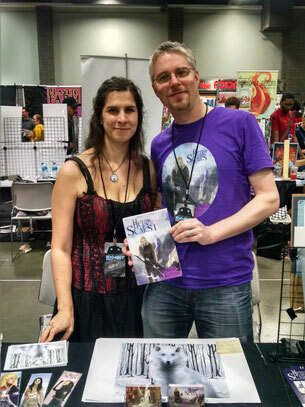 Our goal was not so much to sell at the con, but to get our names and the series out there. We sold a couple of copies on Friday with freebie bookmarks and felt pretty good. It was very cool just to make some connections, chat with people, and maybe the best little surprise was someone asking Vanessa to draw a wolf for her in a sketchbook she was taking around to different artists to make a collection. "How much do I ask?" Vanessa wondered. "I have no idea..." I not-too-helpfully answered. She undercharged in the end, but considering how fast V can sketch, it was a very respectable hourly wage, and the woman was very pleased with original wolf that will remain the very first page of her collection. Okay, it wasn't much compared to many of the vendors and exhibitors, but we were pretty excited as we wandered back home again, and very much hopeful that Saturday would have a lot more action.